I made two complete sets of trappings for the occasion of Northshield becoming a kingdom. They are patterned after a design from the historian Jean Froissart's Chroniques, from 15th century France. 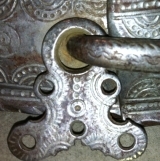 The sets have reins which are strictly decorative, a large petryl covering the chest, and semi-oval pieces on the breeching. I also added both a blanket cover and a saddle cover that works for english or western saddles. 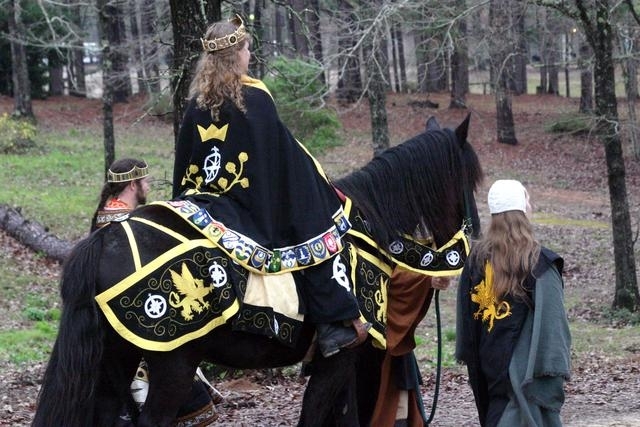 The griffins and compass roses are appliqued and embroidered with colored threads as well as silver and gold metalic threads, and the whole thing is embelleshed with embroidered gold swirl designs. 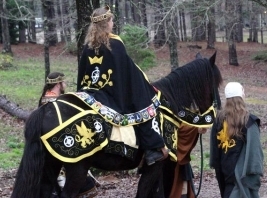 These pictures are of the First Queen of Northshield, Bridei, in a royal procession. The griffin and the compass rose are symbols of the Kingdom. 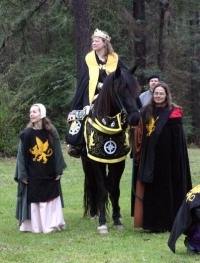 This is my daughter, Delara, on her mount Rocky. 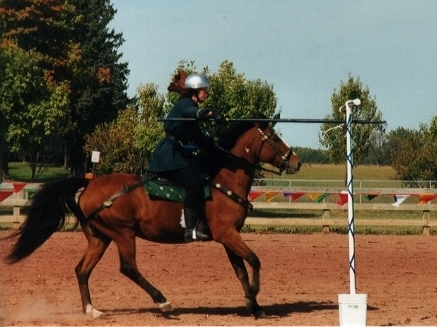 She is dressed as an Ayyubid mounted archer. The Ayyubids were an Islamic culture in Egypt and Syria in the 12th and 13th ceunturies. 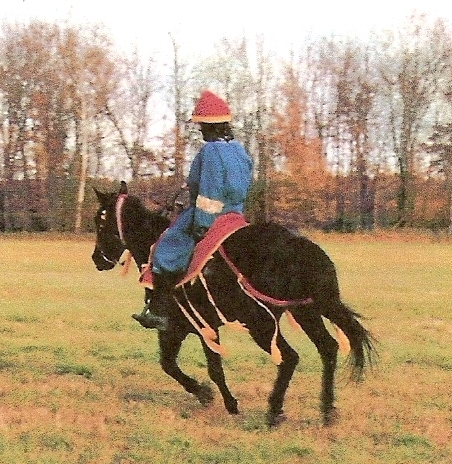 The cloth cap covers her riding helmet quite well, and the saddle cover hides the modern western saddle underneath. 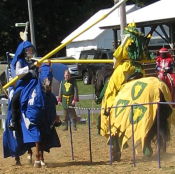 This is the caparison I use when jousting. It is based on a style from King Rene of Anjou's Livre des Tournois, 1450. 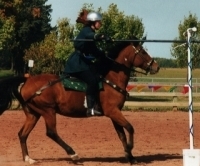 Some things that make it different from most caparisons is that the horse's neck is not covered and the bottom of the caparison is slit vertically, allowing more flow and movement. 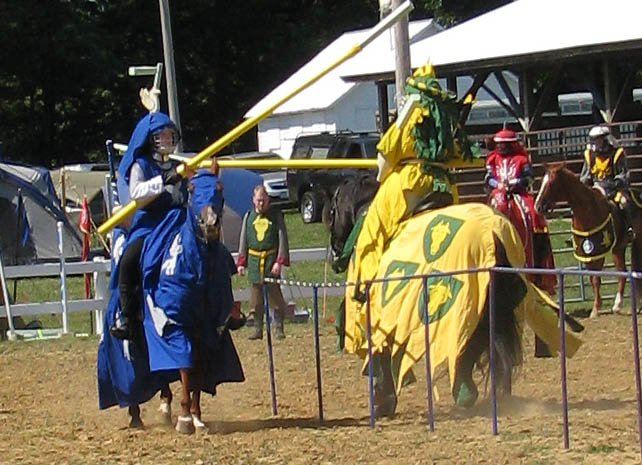 Also, the front of the caparison rises up to the riders waist, covering the legs. 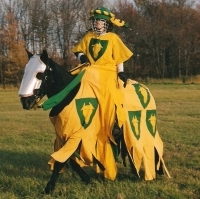 Caparisons were often decorated with heraldry, the pictures which told people who was underneath all that armor and fabric. 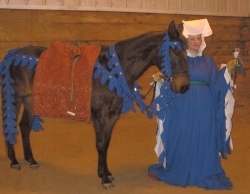 Dagged trappings were quite popular with a number of European cultures. This set comes from Les Tres Riches Heures from the 14th century. Her Ladyship Allesende is ready to go hunting with her falcon in this outfit. 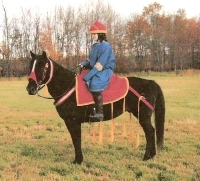 Besides showing off how wealthy the owner was, trappings like these could also help to hold the saddle in place, a necessity when riding over rough terrain in persuit of prey. 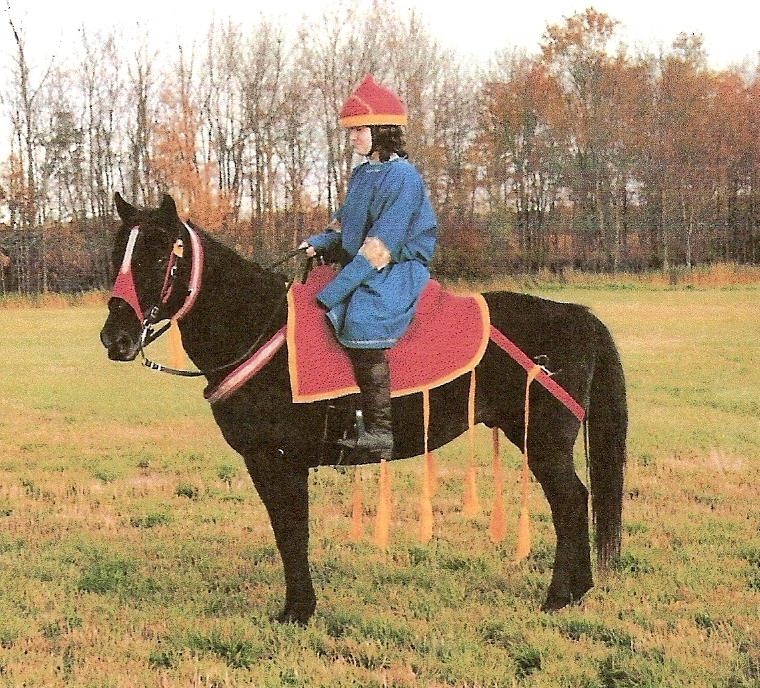 The large saddle covering was often seen when women rode, probably to protect her clothes.